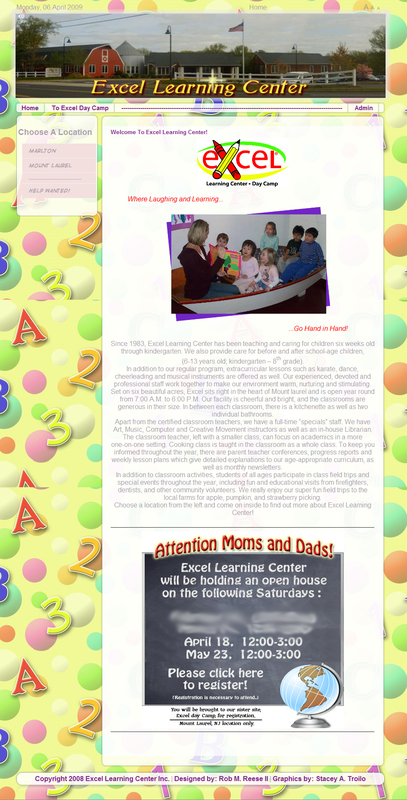 Excel Learning Center is a Child Care and Early Childhood Education facilitiy founded by Mr. William Selig. Excel Learning Center is located in Mount Laurel and Marlton, NJ. It’s a facility full of wonderful eductional and skill building activities! Kids of all ages have tons of fun each schoold year as the certified teachers guide the students through weekly themed educational activities. The website needed to portray the fun and educational experiences that the students at Excel experience every day! We feel that we have captured just that if not more! Take a look!